A party is giving Kelly Whitecastle a chance to play catch-up with old friends, and she’s especially keen on seeing Chris May again, an up-and-coming ventriloquist. But when Kelly sees his show, and Chris’s dummies, a couple named Shirley and Doug, appear to be staring straight at her, it only rattles Kelly’s nerves. It seems that the ghosts of Chris’s grandparents inhabit those grinning heads full of sawdust and they have a warning for Kelly: Chris is in mortal danger. Now Kelly’s working the nightclub circuit to find out who—or what—wants Chris dead. And she’d better do it fast before the final curtain falls on Chris’s act. It’s spring break and Kelly Whitecastle pays a vist to her family and friends. One of her friends, Chris, is on his way to becoming a successful ventriloquist. His two newest puppets, Doug and Shirley, seem to have a special glow to them when Kelly looks at them. It’s not long before she realizes they are more than simple puppets. The ghosts of Chris’ grandparents have taken over the puppets and ask for Kelly’s help. Their grandson is in danger and it’s up to Kelly to save him. Kelly seeks the assistance of her mother, Emma, and Granny Apples in figuring out what is going on and save Chris and his partner Edgar. This is the first book I read in the “A Ghost of Granny Apples Mystery” series, but it definitely won’t be my last. Dummy of A Ghost is a novella and gave me a nice introduction to the series. Although it follows book #4 and is a short story, I was still able to follow along and grew to love the characters. It’s not always easy to combine a cozy mystery with paranormal aspects, but this author does it with style and it makes for a quick, enjoyable read. FTC Disclosure: The publisher provided me with a copy of this book to review for this blog tour. This did not influence my thoughts and opinions in any way. All opinions expressed are my own. 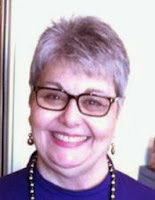 I currently write two mystery series – the Odelia Grey mystery series and the Ghost of Granny Apples mystery series. But I must confess, Granny almost didn’t happen. Not because I couldn’t find a publisher for it, but because I didn’t see the series standing in front of me waving its arms like a windmill. I just wasn’t paying attention. It all started early one morning years ago when I was chatting via e-mail with my then editor of my Odelia Grey novels, Barbara Moore. We were talking about paranormal stories in general and I mentioned that I had a cute idea for a short story about a cantankerous ghost who visits one of her descendants and makes a pest of herself – think Topper meets The Ghost Whisperer. It was just a simple cute story, not a mystery, that I had noodling around in my brain for a few years. Originally the story was for an anthology that I’d been invited to contribute to but which never got off the ground. I had shelved the story in the back of my brain, totally forgotten until the morning I mentioned it to Barbara as an afterthought. When Barbara wrote back that she wanted to hear more, I fleshed out the story line a bit on the fly and sent a short response back, again not making it a mystery. A minute later came another e-mail – she wanted to know more. More? Really? Who was this woman, Oliver Twist? I didn’t have any more, but rather than tell Barbara that, I left my computer and took a shower, getting ready for the day ahead. I would tell her later that there was no more. I don’t know about most authors, but I often get some of my best writing ideas in the shower. There’s just something about warm water hitting my skull that loosens up my clogged, spongy gray matter. It doesn’t happen all the time, but on occasion I have writing breakthroughs and barely take the time to rinse before heading back to the computer to flesh them out. And that’s what happened this particular morning. Halfway through shampooing, I saw the story of come to life and couldn’t wait to share it. Wet and wearing a towel, I wrote Barbara back, explaining that the ghost would be wandering the earth trying to find someone to exonerate her of a murder. She’d be from someplace cool like Julian, California, during the gold rush days. And her name would be Granny Apples. That was the turning point – giving the ghost a name. She came to life and stood ready to have her story told. The e-mail sent, I finished getting ready for the day. When I returned to my computer there was another message from Barb: This is not a short story. This is a novel. Okay, I told her, writing back, I guess it could be a cute stand alone. No, she responded almost immediately, it’s a series. How soon can you get me a manuscript? And thus the very popular Ghost of Granny Apples mystery series was born. And Barb was right. Granny Apples wasn’t a short story, it was a full-blown mystery series. After the first three books, I moved the series to Penguin/Berkley. 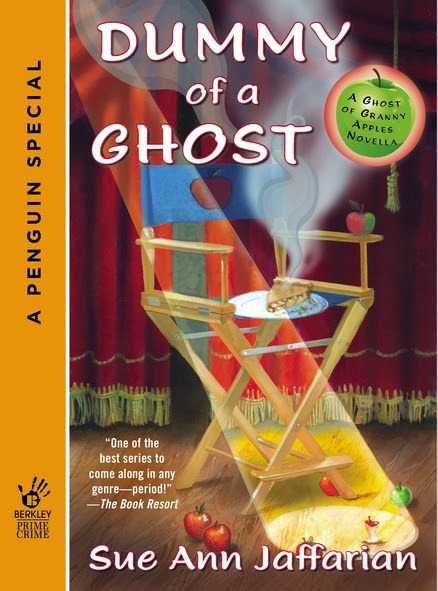 In 2013 they published a novella, The Silent Ghost. In March 2014 another novella, Dummy of a Ghost, will be released. The fourth full novel, Ghost of a Gamble, will be released in April 2014, with another full novel coming out in 2015. I have also written proposals for future novels in the series. The lesson here is two-fold: 1) don’t listen to me, I’m lost in a fog and need running hot water to clear my head; and 2) listen to the people who know and don’t be afraid to bounce ideas off of their heads. They might recognize a gem when you think you're holding a common rock. How would you like to win an e-book copy of Dummy of a Ghost by Sue Ann Jaffarian? Thanks to Berkley, I have one e-book to giveaway to one lucky winner. The giveaway begins on March 17th (midnight est) and ends on March 21st (midnight est). I'm a huge fan of Sue Ann's, so I'm glad this novella convinced you to read more of her books. Thanks for the great review and for having me on your blog! I do love this series!! I love this series, but have not read either novella on my kindle…… Looking forward to Ghost of a Gamble! I love trying out new (to me) authors, especially those cozies with a slight paranormal twist. Thanks. Hi SA, I do love your books and as you might remember own a few of them. I'm entering this giveaway because it's you. I never enter e-book giveaways because I hate reading on my tablet. For you I'd spend an evening reading a Granny Apples adventure. This sounds like a fun paranormal cozy. Nice guest post too! Looking forward to reading your series. I read the first book in this series and really liked it. Loved hearing how the books came to be. this is would a great 'add' to my collection!!! !